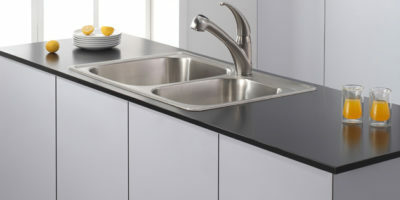 Colony Soft is one of the top rated kitchen faucets on the market with its outstanding features. 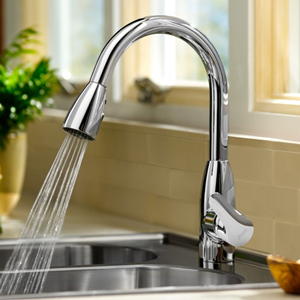 Let’s go through all the details in 5 sections of American Standard Colony Soft faucet review in this post. Scratch resistance, stain resistance, wear-and-tear resistance – these are just some of the physical properties which come with the shiny, highly-polished design you’d notice on your first look at this Colony Soft Pull-Down Kitchen Faucet from American Standard. The point is it’s not just about appearances with this drop-down faucet, although you might be forgiven for thinking so because it looks so good. It has that luxurious sheen which comes with the polished chrome finish, which is the official color classification as well. Underneath the polished chrome color and finish is a solid brass body, which is largely what contributes to its robustness and durability. Style-wise, this soft pull-down faucet would be classified as transitional, which means it can pretty much fit in with any kitchen design. It would just as much be right in place installed in a contemporary or ultra modern kitchen as it would be in a more retro-styled kitchen. Installing it in a retro-styled kitchen would have to have you perhaps complementing it with other silver appliances or exposed utensils, simply because it draws a lot of attention to itself with a type of sheen that amplifies even the slightest bit of light in the room. 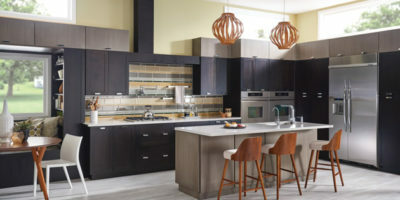 This is unless you specifically want it to be the focal point of the kitchen, which is a role it assumes very well either way. Out of the box, you get one solid piece, but its use is extensible once you’ve had it installed with the pull-down spray that has an adjustable water spray pattern. The pull-down also has a pause feature and the spout (made of brass) swivels nicely. The spout height is a good 14-5/8 inch and the unit has a reach of 8inches from its base. One handle is enough to control a flow rate of 2.2 gallons per minute. For installation considerations, this faucet weighs 5.9 pounds and features measurements amounting to 22.1 x 14.2 x 3.3 inches and it requires a deck mounted installation. The installation offers quite a bit of flexibility in terms of mounting because the unit can be mounted both with and without the supplied base plate. It looks great either way. In deployment this simple one-piece kitchen faucet simply gets the job done and it gets it done well. Once you’ve turned off the water supply following whatever cleaning, filling or rinsing job you’re done with, you almost forget that you’ve just used any faucet. Yes, that means you get drip-free performance which is so good that you hardly notice even a single drop into the sink after you’ve turned it off. In addition to ensuring the unit requires very little maintenance, the integrated ceramic disk makes the faucet’s operation very smooth. You get a very intuitive response for controlling the flow of water and this smooth performance holds up really well even under extreme weather conditions, whether it’s very hot or very cold. The valve is built tough as well, harboring the ability to undergo over a million cycles (on and off) without failing. So there’ll be no more of those ancient stories featuring a leaky faucet. 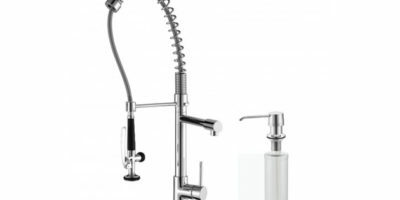 Yes, there is a pull-down sprayer integrated into the faucet as well, hence the name “soft pull-down,” which comes with a lot of conveniences. You can adjust the pattern of the spray and you can even pause it as well for extra convenience. 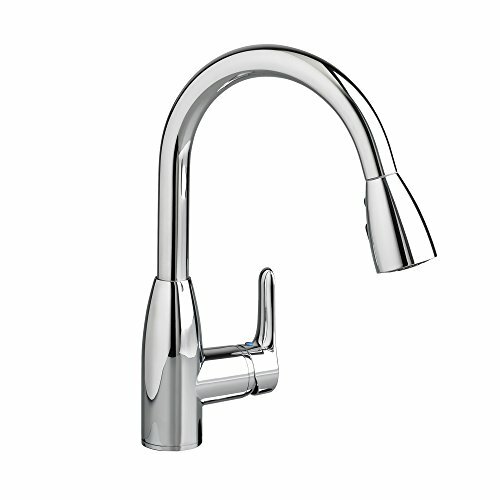 For the price (this is the lowest priced pull-down faucet we’ve featured) you get a whole lot of “faucet” and it really looks good too, offering great performance. 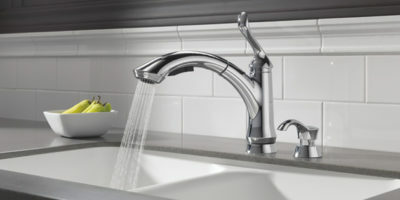 An integrated ceramic disc valve is the one feature which makes this faucet free of any maintenance and although the outer surface is coated (rather thickly) with chrome instead of something like stainless steel, it pretty much performs like stainless steel in terms of keeping dust or other forms of dirt off. If there’s steam in the room, it glides off effortlessly as it condenses into liquid form and the waterfalls quite nicely down the smooth contours into the sink, disappearing into the drain very silently.